Gold was a little choppy overnight, trading in a range of $1294 - $1301.45. It climbed to its high of $1301.45 early during Far Eastern hours, helped by the discord at the G-7 meeting this weekend (dimming hopes that the US and its major trading partners can avoid a destabilizing escalation in trade sanctions against each other) and a dip in the DX. The greenback fell to its low of 93.36, pressured by strength in the euro ($1.1754 -$1.1820) on assurances from Italy’s Finance Minister that it won’t exit the euro, and that it wanted to avoid financial instability). Also, a tumble in bitcoin (exchange is hacked, report US regulators investigating price manipulation at some exchanges) was supportive for gold. Later during European time, the DX rallied back (93.68) against a fall in the pound ($1.3440 - $1.3345, weaker UK Industrial Production and Construction Output), and a pullback in the euro ($1.1775) and knocked gold to its $1294 low. The yellow metal was also pressured by some upbeat comments from Secretary of State Pompeo ahead of Trump’s summit with Kim (“talks moving quickly”…hopeful the summit will set conditions for future productive talks, Trump prepared to offer security in exchange for a North Korea free of wmd). Mostly firmer US stocks were a headwind for gold with the NIKKEI up 0.5%, the SCI off 0.5%, European markets were up from 0.2% to 0.9%, and S&P futures were +0.1%. A decline in oil (WTI down to $64.85, Russian output rose to 11.1 M bpd) weighed on equities. Just ahead of and through the NY open, rebounds in sterling ($1.3375) and the euro ($1.18) pushed the DX back to 93.42. Gold traded higher, and took out the overnight high to reach $1302.30 - but resistance there (5 tops 6/1, 6/5,6/6, 6/7 and 6/8 highs, $1301 – 50% retracement of up move from 12/12/17 $1236 low to 1/25/18 $1366 high) capped the advance. During the late morning, US stocks added to their opening gains (S&P +8 to 2787, telecom leads gainers), with investors shrugging off the stormy G7 meeting. A recovery in oil (WTI to $66.32) aided the move. The US 10-year bond yield hovered around 2.96%, and the DX rebounded to 93.62. Gold came off its highs, but was supported at $1300. In the afternoon, US stocks continued to advance, with the S&P rising 12 to 2791. The 10-year yield remained steady between 2.96%-2.97%, as did the DX around 93.60. Gold ticked down through support at $1300 to reach $1299. Later in the afternoon, US stocks dipped to finish +2 at 2781. The 10-year yield ticked down to 2.95%, and the DX traded slightly lower between 93.56-93.60. Gold traded back up to $1300.50, and was $1300 bid at 4PM with a gain of $1.50. Open interest was off 3.5k contracts, showing a combination of some early long liquidation down to $1294 followed by some short covering on the rebound to $1300 later in Friday’s session. Volume was lower with 232k contracts trading. The CFTC’s Commitment of Traders Report as of 6/5 showed the large funds cutting 8.3k contracts of longs and 4.6k contracts of shorts to reduce their net long position to 111k contracts. 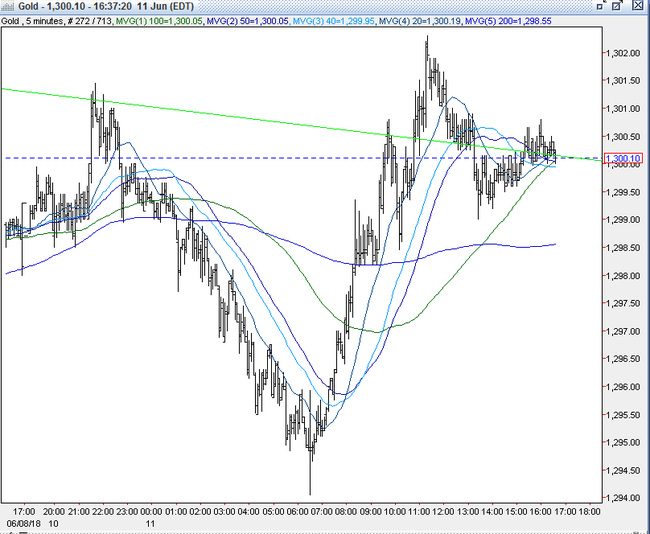 This was done on gold’s pullback to $1290. While the reduction in the NFLP doesn’t help sentiment, the position remains relatively and historically small, and it leaves the gold market set up well to move higher - provided there is a spark - as there is plenty room for sidelined longs to enter (total open interest down to 423k). Bulls were looking for more of a boost from the chaotic G7 meeting. 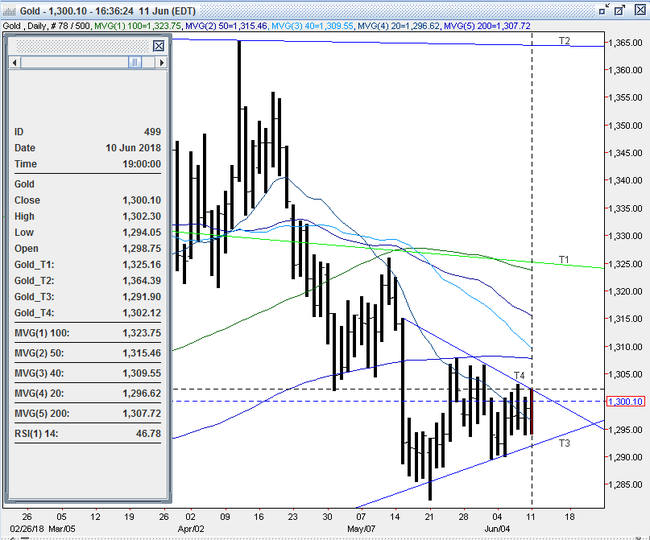 However, they were pleased how gold rebounded off of support today at the $1294 low. They remain encouraged by the bullish set up from Friday’s COT Report (still very light NFLP). They also believe that the dollar’s recent run-up from 89.25 – 95.03 (+6.48%, 14-day RSI touched 78.4) in the past 6 weeks has been vastly overdone, and expect a major pullback in the DX to fuel a gold rally. The bulls look for a breach of initial resistance at $1301-03 ($1301 -03–6 tops 6/1, 6/5,6/6, 6/7, 6/8, and 6/11 highs, 50% retracement of up move from 12/12/17 $1236 low to 1/25/18 $1366 high, down trendline from 5/15 $1315 top) followed by the quadruple top at $1306-08 (5/24, 5/25, and 5/29 and 5/31 highs) and the 200-day moving average at $1308 to ignite more significant short covering along with some momentum buying to bring about a test of $1315 (5/15 high). Bears remain comfortable selling into rallies, though more have bailed recently as witnessed by the 4k decline in gross shorts from Friday’s COT Report. Bears are still expecting another leg down in gold’s 2-month old down trend, and look for the dollar’s rally to resume to pressure gold lower. They first need to get through initial support at $1294-95 (quadruple bottom – 6/6, 6/7, 6/8, and 6/11 lows), and then will gun for long liquidating sell stops below $1288-91 (5 bottom low - 5/22, 5/23, 6/1, 6/4, and 6/5 and up trendline from 12/15/16 $1123 low) to bring about a test of the 5/21 low at $1282 and then $1273-75 (options, 12/25 and 12/26 lows). All markets will continue to focus on the volatility in the equity and bond markets, geopolitical events (especially the Trump-Kim summit), developments with the Trump Administration (especially on US-China trade), oil prices, and will turn to reports tomorrow on Japan’s Tertiary Industry Index, UK Employment Change, German ZEW, Eurozone ZEW, US NFIB Small Business Optimism Index, and CPI for near-term direction.